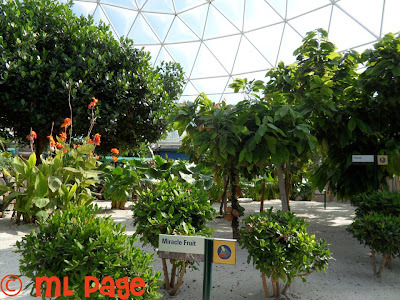 Living with the Land is often overlooked which means that unless its raining and people are escaping the wet weather you can usually walk onto this fun ride and see some of science behind Epcot's Land. Also, there are quite a few hidden mickeys to be found here! This is my chidlrens FAVORITE RIDE!!! Wee must have ridden this 10 times in a ROW!!!! One of my favorite rides and I love that my 8yo loves it just as much! I love that you see something new every time. For example, I don't think I've ever noticed this miracle fruit before. This attraction is awesome! They'll show you how they engineered Mikey-shaped fruits! Our favorite are the Mickey shaped pumpkins!! :) We LOVE Living with the Land! The picture is beautiful! After Soarin', my family and I always head over to Living with the Land. It's a relaxing ride where one learns a lot. Last year, my daughter and I took the Behind the Seeds Tour and learned even more! Love it! I love this attraction. It is always a nice relaxing break. I love going on this ride. It's always neat to see the plant's. Great ride, but needs to add back to host to the ride rather than having the announcement of it. I love the Land - miss the old song - listen to the land...listen to the land - hoping to do the behind the seeds tours this year when we go down. pretty, i've never stopped by this attraction. I stumbled upon this ride one year having no idea what it was and now I make it a priority to visit it with newbies. It's so neat to see how they grow everything!! Definitely going to ride this in a few weeks. Great photo. This ride prompted me to research more on Disney's hydroponic garden/greenhouse. We make sure we take the Behind the Seeds Tour and wish someday we can have a greenhouse even a smidgen as good as Disney. My DH would love a garden like that!